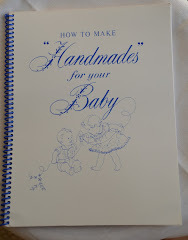 The Old Fashioned Baby Sewing Room: Lesson One - Guidelines and Begin!! Lesson One - Guidelines and Begin!! If you are just now joining and need to know what materials you need - click HERE! This is a weekly Lesson and I hope you can all be with me today to begin the lesson. You will actually have one week to complete each Lesson. In other words Lesson 1 should be done before Lesson 2 etc. So, it doesn't have to be finished today. Lesson One Question - Who are you making the Daygown for? A special little person or just for fun? 1. Email me at jbaumeister@cox.net and let me know you will be joining the group. (if you already emailed me, please email me again!) Latecomers are welcome! If you have never made a comment on a post before, you might need to register. You will be told what to do when you attempt to post. And you always have to type in the little squiggly word for the post to go in - that is so Google knows you are not spam. 3. Questions! No question is silly. All questions must be asked through the "comments" under each Lesson Post (no email questions-sorry). And the questions can only be asked during the week of the Lesson Post. You have until the following Thursday to ask questions. And the questions must be made under the Lesson post it pertains to. I will answer every question and you can ask them right up until the following Thursday. Example - Lesson 1 - You can ask any question about Lesson 1 (this first Lesson) by posting a comment at the end of this Lesson One post. Once Lesson 2 is up (really the night before), then no more questions about Lesson 1 will be accepted. So it is best to stay caught up with the group. Now -Make a Comment below this post and then....Begin Lesson One! I'm excited to begin the Daygown Sew Along. 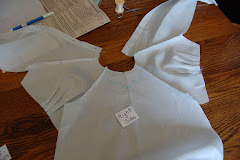 I'm making a blue gown for my fifth child, a little boy 8 weeks old. I'm hoping to improve my handsewing skills, since I usually stitch mostly by machine. 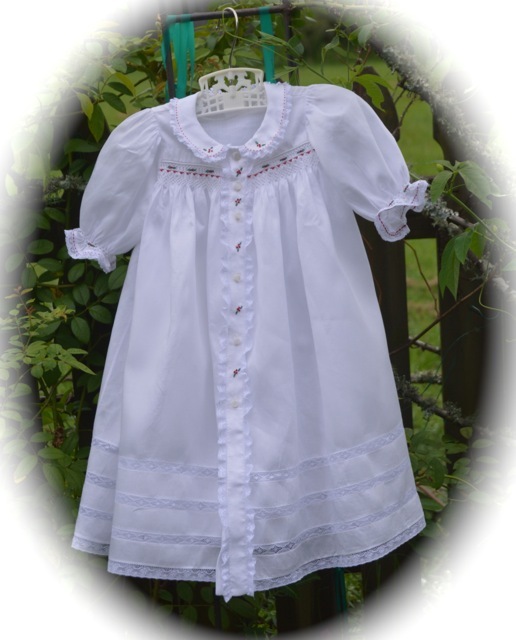 Elisabeth Rose, The embroidery on this daygown is elaborate but is appropriate for a boy. But I do think a simpler design would be more tailored. You might just embroider the design at the neck and leave off the embroidery at the hem. You can always add it later if you like. I'm so excited to get started on this beautiful daygown with the sew along group. I have not made this daygown and what better way to do this than with you. I making an all white daygown for fun. How ironic that you and I were recently discussing my desire to just sit and stitch a little daygown. Count me, and my one good sewing eye, in! I have chosen white fabric with ecru lace. The gown will be just for fun right now, but maybe a gift someday. Hi, Jeannie, I'm excited to begin! 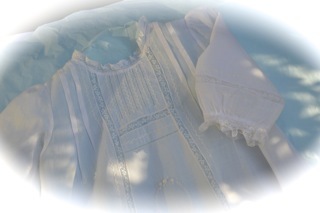 My little daygown will be going into a grandmother's hope chest as there are no little ones here or on the horizon ~ yet! As my children grew, I put aside the delicate stitches and now I can 'play' to my heart's content! Thanks for the lessons ~ and the scones! I am in as well...going to make a daygown for a little girl that is going to be born in about 4 weeks. Can't wait! The daygown will go into a great-grandmother's hope chest. This dress will be for my daughter's collection of baby clothes for her "future" children. I'm ready to go. 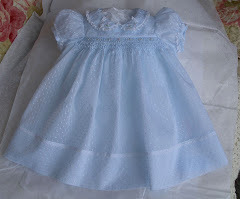 I'm making the blue gown, but I figure it will be for a girl. Nobody specific--it may end up in my daughters' hope chest, or if a friend has a girl anytime soon it might be given away (but I just finished a "Smocked Baby Clothes" dress that is first in line). I'm excited to join the sew along. The gown is just for the experience and no baby in mind yet. I am not currently making this gown for anyone in particular. Hello Jeannie. Thank you for posting this class. I am making this gown in hopes of a future daughter for my niece. Jeannie....I am making the gown definitely for fun and maybe for a gift....if I can bear to part with it when it is finished!!! I am assuming 100% cotton white batiste is ok to use? I don't have any of the type of fabric you mentioned in your post. Thanks...this is going to be fun!!! 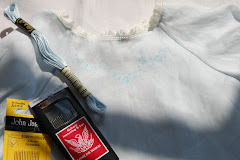 I am excited about this daygown sew-along! I was going to make this for my new granddaughter but "she" turned out to be a boy! LOL I think I will plan to make this one girlie anyway and give it to my next granddaughter. Hi! I am a great admirer of your beautiful sewing and your patterns. I would love to join ths sew-a-long. It will be my first! I have a lot of your patterns but not this one. (Can't believe it!) I will order it and get some white lawn I have prepared. This will be for Figment, I think. Thank you for hosting this. I feel like I will be taking a class from you! I am making this gown to relieve the stress in my life and with each stitch will count my blessings. Hi, Jeannie! 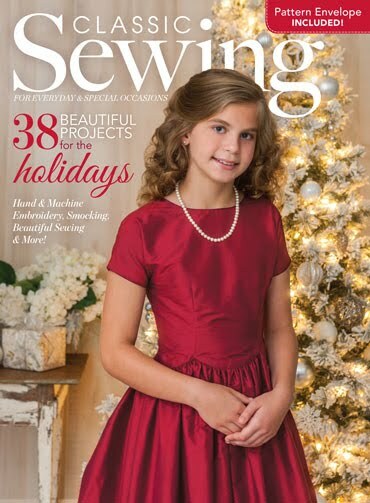 I am making the gown for fun and mostly to improve my heirloom sewing skills with your expert guidance and advice! Looking forward to it! Jeannie, I already have a couple questions...mostly just curiousity! 1) Why do you use two different kinds/weights of thread in your sewing? 2) This will be my first completely handsewn gown. When we put running stitches in the back, they will show through on the right side of the garment, right? Is it typical to use a running stitch that shows the tiny gap between the stitches? Machine sewing would look more like backstitching, so just curious about this. 1. The threads are two different weights. The DMC thread is too thick to use for lace. You want a very fine thread when sewing lace to anything - lace to lace, lace to fabric etc. When I sew lace , I always use the lighter thread, in the color of the lace. 2. Yes the running stitch threads show on the right side because you need to go through ALL the layers of fabric. And there will be gaps between the stitches. Ideally, your stitches are small but don't worry too much if they are not really small. But try to keep them even. Hi Jeannie - I'm joining in the sew along and excited to be here! I'm sewing for my first grandson, due Dec 21. Thank you for the lovely tea and scones! Answer: God willing...I'll have another baby some day to wear this daygown. Hi, can't wait to get started on this daygown for my youngest, Maggie. Can't wait to get started. I'm making the gown for my grandbaby hope chest! Hi Jeannie! I am making this for fun. I have never done anything completely handsewn and would like to learn. When you do the running stitch do you try and use one length of thread for the entire facing? You would be working with a very long thread but would not have to tie off. Whats the correct length of thread to use. I am really looking forward to this. I LOVE to make baby clothes. Question/Answer to Sherry - I usually recommend 18 to 20". It doesn't matter if you tie off when stitching the facing. Hide the knot under the facing. And I forgot to tell you all to wax your thread with bees wax! Hi Jeannie, I am making this for My daughter's hope chest. I am soo excited to learn French Hand Sewing. This is my first project. Thank you for taking the time to post all of the lessons. You are greatly appreciated!! Hello and thank you a bunch for putting this up!!! Emily, I am so pleased you are going to be making a daygown with us! How old are you? Count me in, as I need a sewing distraction. I plan to make this for a hope chest, but I might have a new great niece as a victim. I also have a friend who is having twin girls in the fall so this would be a good gift. I'm going to be sewing the daygown for #3 due in September. I still need to order the pattern so I'll have to play catch up next week. but if it turns out well it may be a gift for a future baby girl. Good Morning....Just found out I'm going to have a new little grand daughter. This will be perfect!!! I'm a little late to the party but can't wait to join in the fun. I am making the daygown for my grandmother's hope chest (which is gathering a lot of dust). I am so excited to be a pert of this sew a long!!! I am going to sew this entirely by hand using pink Swiss batiste with white lace. I am sewing this for my Son's hope chest ( he doesn't know he has one started - in fact he doesn't even know what one it is!! )Thank goodness for Moms!! Thank you for all the time you have put into this for ALL of us!!! 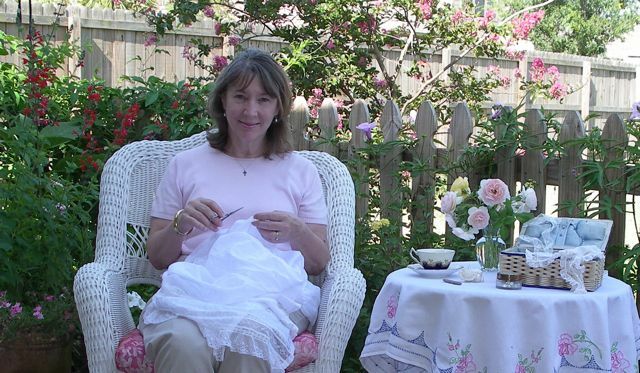 Hi I have been sewing for 55 years and sew almost every day. I just love sewing and giving things as gifts. This will go into a grandmother's hope chest. This will be the first project that I have done entirely by hand. I am looking forward to it. I am going to join you class. Home for another 4 weeks after surgery, so this is a perfect time for me. Two of my ladies in my dinner group are having granddaughters in October, so hope to make 2 gowns. I know that's a big order for me. Hi there! 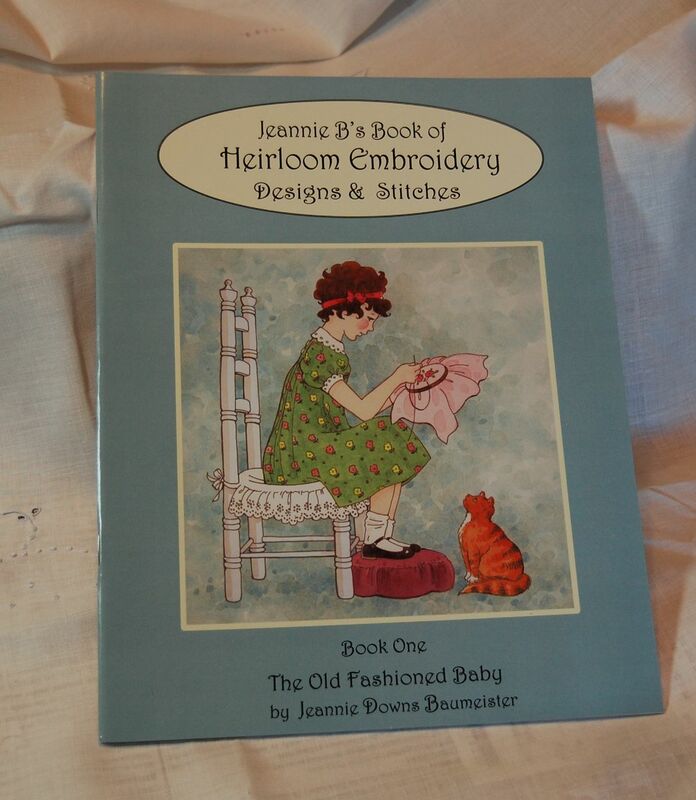 Just found out about this blog and sew along (although not about Jeanne B and Old Fashioned Baby!) I would consider it an honor to be a part of this group! I've never participated in a sew along before so hopefully I can keep up. I'm making this for fun, to practice my heirloom sewing skills, and for hopefully a future granddaughter! I am so excited to start the sew along. Like others, this will be going in my grandmother's hope chest. I hope to improve on my heirloom sewing skills. Hi, Jeannie! Another question for you: I noticed you say not to pre-treat the lace. Do you ever pre-treat the trim (whether lace, swiss trim, rick rack, etc) for your garments? I am have two sweet grandbabies due in January and March - so I will be sewing two daygowns with you. It will be such a pleasure to be sewing with you. 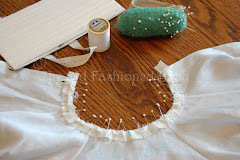 I have two sweet grandbabies due in January and March- so I will be sewing two daygowns. It will be such a pleasure sewing along with you. Thank you so much for sharing with us. 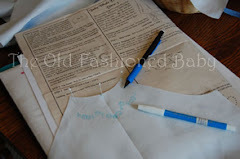 When sewing a baby gown by hand, do you press after each completed section? For example, after we complete the stitching on the back facings, do we press them or wait until the entire gown is finished? 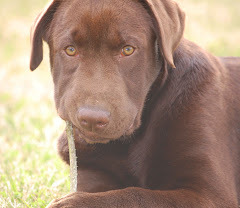 Question/answer to Darby: When I sew, by hand or machine....I always press after each step. When using nice cotton fabric, finger pressing is often all that is needed but I usually go to the iron. I am looking forward to starting my infant gown. This will be 2 firsts for me: doing a class on line and making it entirely by hand. I'm making this for a hope chest... my daughter is due in Feb. but we don't know if it's a boy or girl. 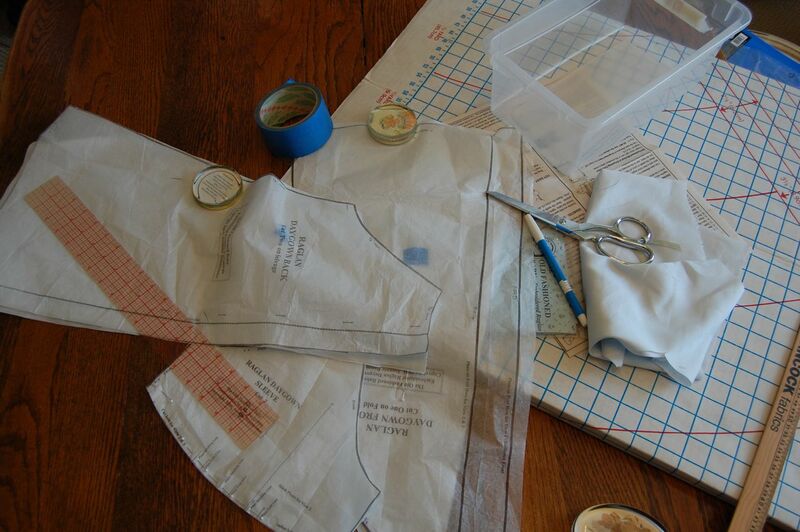 I am really looking forward to making a daygown completely by hand! It will be my first on-line class and a first project completely by hand. I'm making the daygown for fun. This will be my first hand sewn garment although I have had a couple of Jeannie's classes at SAGA conventions. I ordered the pattern and kit Monday afternoon, and it arrived today. 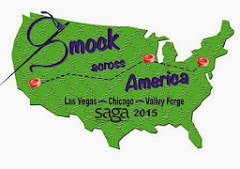 Do you know if SAGA will allow FHS points for the class? Question/Answer to Rebecca: I talked to SAGA artisan about this and the answer at this time is no I can't award points. I wish I could. You late comers are all welcome. I will look forward to seeing you at SAGA. Hope to see the daygowns too!! yes I do pretreat trims. I use a steam iron on them. This preshrinks them. If you are truly worried about a particular trim shrinking (not lace), you can wet it and lay it out to dry. I will tell you more about the lace when we get to the lace part! I have finished the facings and notice that my needle is now slightly curved. Is that to be expected or an indication that I'm doing something wrong? Answer to Rebecca - I just had to laugh!! It is an indication that you need to relax when you stitch. Try a glass of red wine, hot tea or what ever you need! You are holding the needle so tight that it's bending. Just throw it away and get out another one. The daygown is for fun, not for any one in particular, and your timing is perfect. I could use a break from getting my 3 year old's fall wardrobe finished and I'll be traveling over the next few weeks so hand sewing is perfect. Thanks so much for doing this Jeannie! I will be sewing along with you. My niece is going to have her first baby in December, and will be the reciepient of my gown. Thank you for all your expert advice. Love your blog !! !